Circumference of Daisy is 4.5"
Black and White is always good together. 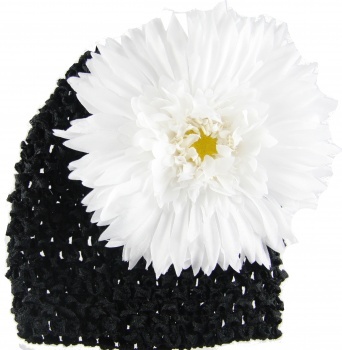 This is a black waffle beanie with a white spiky daisy attached. The beanie fits a newborn to small head great and this daisy is a large size to really show off on the side of this beanie. The daisy is attached with a white grosgrain ribbon to an alligator clip so it easily slides on and off this beanie so you can adjust exactly where you want the daisy to be. Or even wear the daisy or beanie alone since it can be easily separated. It has a bright yellow center and is 4.5" circumference.